Comments: Saint John's Episcopal Church is located at the north corner of Bird and Harrison Street in Scottsville. 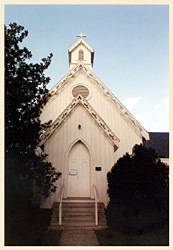 This white frame church with Gothic windows and a scrollwork vergeboard was built in 1875 and was the second church in Saint Anne's Parish. 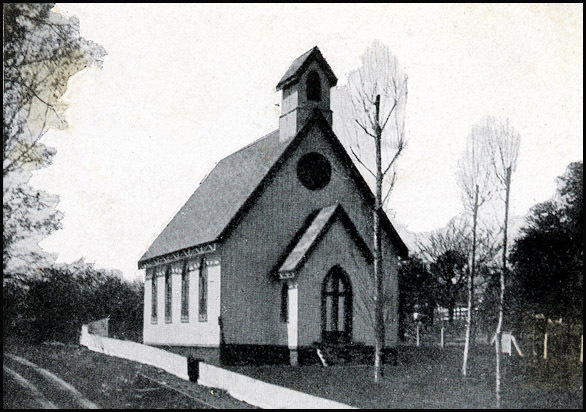 The photo above is from an early William E. Burgess postcard; at right, Saint John's Episcopal Church is shown as it appeared in 2001. The Burgess postcard of Saint John's is from the collection of Jack Hamner. Jack resides in Scottsville, Virginia.